University campuses all over the world remained relatively calm during the first decade of the new century. The lack of student activism prompted comments about the apathy of today’s students compared to the high level of political awareness and commitment of their predecessors in the late 60s and throughout the 70s. By contrast, 2011 saw waves of student protests around the cost of university education in places as diverse as Seoul, London, Berkeley, Bogota and Santiago. Some observers see the affinity of students for street protests as a ritual of political coming-of-age. After all, young adults’ first consequential political interactions with their governments are usually over how much they will pay for school and what they will get in return. So it makes for a natural flash point. Others see the failure of governments to enact reforms in a timely manner as the spark that lights the powder keg. In the case of Chile, there was widespread agreement on the technical diagnosis and the need for reform, so it is worth pondering how such a tense conflict came to be. What started as a demand by secondary school students that their free transport pass be extended to the entire calendar year. Ironically the government rejected that initial demand citing high budgetary cost but later agreed to a reform package costing 20 times as much as the initial request of the students, the conflict has evolved into a full-blown confrontation between secondary and university students organizations and the entire government. The leading factions of university students went as far as demanding a Constitutional amendment that would guarantee free public, high quality education for all. This conflict has had a few remarkable features worth underlining. First of all, for years now broad consensus existed on the urgent need for reform. Many university students, education policy experts, and even government officials welcomed and agreed to the recommendations of the 2009 Review of Tertiary Education in Chile prepared jointly by the OECD and the World Bank. Indeed, several initiatives under discussion—both the more clearly articulated student demands and the proposals offered by the government—are fully aligned with some of the international report’s main recommendations (e.g., increased public funding for tertiary education, extension of scholarships to all eligible students from the lowest two quintiles, unification of the two existing student loan schemes, reduction of unsustainable debt burden). However, the rate and the depth of reform have been slower than what students wanted. Paradoxically, the current government has made greatest strides in trying to change tertiary education compared to previous governments, but is facing the most radical demands. Quicker implementation of the consensus recommendations—including by the previous government—might have helped avoid radicalization. Second, it seems that, ironically, the leaders of the protest movement are among the relatively more privileged students enrolled in CRUCH universities, not the students from generally lower-middle class and poorer families who receive fewer public subsidies and benefits. In Chile, the 25 oldest universities belong to the Consejo de Rectores de las Universidades Chilenas (Council of Rectors of Chilean Universities). Established in 1954, the Council regroups the country’s 16 public universities and the nine oldest private universities, which receive public subsidies for their operation and whose students have better access to government scholarships and loans than all the other students enrolled in non-CRUCH universities. The leaders of the traditional student organizations see public, free education as the solution, and have declined invitations from the government to dialogue around more moderate reforms. At the same time, alternative views have popped up on social media such as YouTube, suggesting that the fee-paying students would be happy with equal access to subsidies rather than the elimination of private (many of them de facto for-profit) tertiary institutions. Fourth, the protests have spread to other countries in the Latin American region, such as Brazil and Colombia. In Colombia, for example, students from both public and private universities have demanded the abolition of fees across the board, increased funding for public tertiary education, and the transformation of student loans into grants. Robust pressure from the streets, through mostly peaceful demonstrations bringing students and teachers together, forced the government to withdraw the draft Higher Education Reform Law from Congress. From a higher education policy viewpoint, other governments may want to draw some lessons from the current crisis in Chile. The first one is that there may be a high price to pay for delaying or not implementing needed reforms, especially after important issues have been put on the public scene. Good technical analysis creates the hope of change and dashed expectations may be a factor in igniting protests. 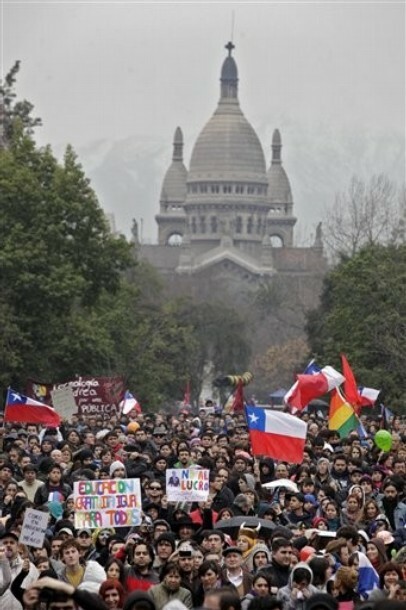 Second, in countries such as Chile that have a track record of sophisticated reforms in tertiary education, feedback mechanisms should be in place to test the frame of mind of key stakeholders on a regular basis, to avoid as much as possible uncomfortable surprises and challenges such as those experienced today by the Chilean government. The third one is the risk of back-tracking if the government decides, under political pressure, to abandon some of the more innovative features of the Chilean tertiary education system. This could help resolve the crisis in the short term but would likely have long term adverse consequences, as illustrated by the Irish example of fee abolition in the 1990s. Ireland was the first Western European country that introduced tuition fees in the beginning of the 1990s, which helped improve the financial sustainability of the higher education system. In 1996, however, the new Labor government abolished the fees to fulfill electoral promises. As a result, not only did equity not improve because in the absence of fees the poorer part of the population ended up subsidizing free studies for the middle class, but in addition quality has suffered overall for lack of sufficient public funding. Sound policy reform based on good technical analysis is not guaranteed to satisfy all stakeholders or quell political protest. However, in order to stay ahead of the curve of public opinion, governments may find it easier to engage with civil society more around conference tables and less in the streets.